Question: What is the connection between letters and digits? 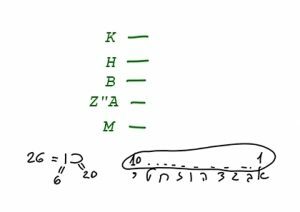 Answer: All the letters in the Hebrew alphabet have a numerical value. “Aleph,” “Bet,” “Gimel,” “Dalet,” “Hey,’ “Vav”, “Zayin,” “Het,” “Tet, “and “Yod,” for example, are the first ten. Every number can be expressed both by a letter or a digit. Since the digits arrived after the letters, all the numbers were first denoted by letters. The number “26,” for example was indicated by the letters “Kaf Vav” because the sum of these letters equals 26 (Kaf is 20 and Vav is 6). The letters express certain attributes of the spiritual force: either of Hochma, or Bina, the Light of Hassadim, or the Light of Hochma, etc. Today it is more convenient to use numbers because it is a more specific form of expression. But the letters, in fact, express the same thing. Question: How is numerology related to the wisdom of Kabbalah? Are they related? Answer: The wisdom of Kabbalah is not related to anything. As for numerology, prophecy according to digits doesn’t mean anything. Question: And what is gematria? Answer: Gematria is the numerical expression of any word and any command. It indicates the specific intensity of a specific word or order, the specific Light and level one is on. But if there are no such levels in a person, he cannot manage them. When he hears or sees a certain word in a book, some gematria, it is an empty phrase for him. We can only clarify and understand this according to our spiritual attainment. It is only through unity that we can attain the secret of the numbers and the words!